High quality documentation is an essential feature of any reasonable modeling and design software. After all, such software is used for doing more less complicated things, and it would not be acceptable that users spend excessive time on just finding out how the software works. It must clearly explain principles of the used physical model, underlying assumptions and used approximations, considered physical effects, etc. It well explains the user interface so that users can use it in the most convenient way. If a script language is offered, the features of that language need to be explained in detail. It gives an overview on supplied files, including e.g. the supplied demo files. In addition to introductory explanations, for certain aspects such as offered mathematical functions there should be a reference section, supporting a quick look-up of details. Note that producing high-quality documentation requires highly developed didactic skills, which not every programmer has got. The developer of the software, Dr. Paschotta, is very experienced in this area. 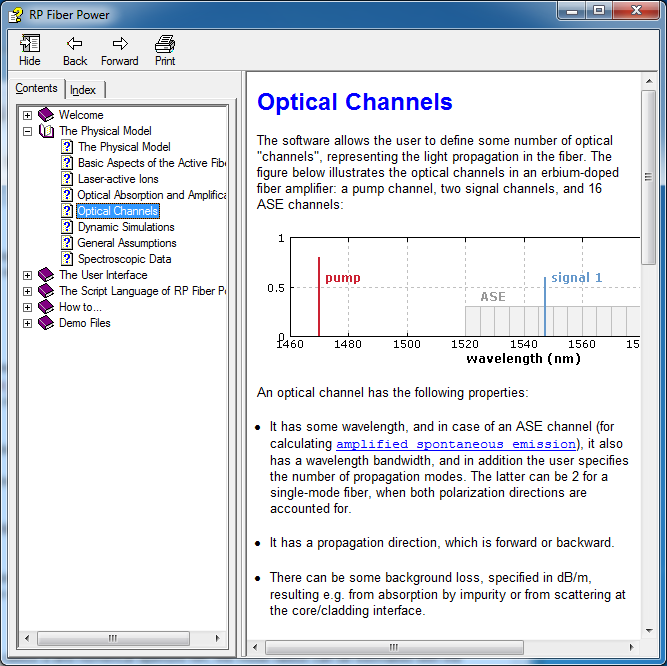 All software products from RP Photonics come with a comprehensive software manual in PDF format. (As an example, you may download the beginning of the RP Fiber Power manual with the table of contents.) In addition, RP Fiber Power, RP Resonator and RP Coating have a comprehensive context-sensitive online help system (see the screen shot below as an example). Of course, any remaining questions can be clarified using the technical support.